Home News Bitcoin rebounds on Friday to pass $15,000 before dipping below $13,900 late Saturday as virtual currency ends week on wild ride. Bitcoin rebounds on Friday to pass $15,000 before dipping below $13,900 late Saturday as virtual currency ends week on wild ride. 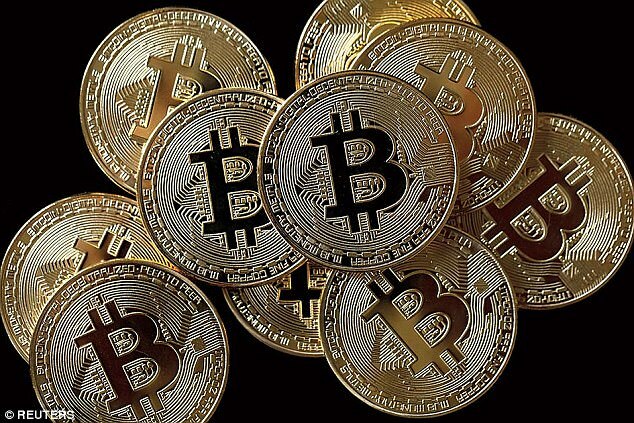 Bitcoin rebounded somewhat on Saturday, briefly topping the $15,000 mark after a steep decline earlier in the week fueled concerns about the speculative nature of the popular virtual currency. Last week, bitcoin reached a high of nearly $20,000 before nosediving to below $11,000 at one point on Friday. After losses over the last few days, the digital currency fell as much as 30 percent overnight Friday in Asia, and the action became so frenzied that the website Coinbase suspended trading. 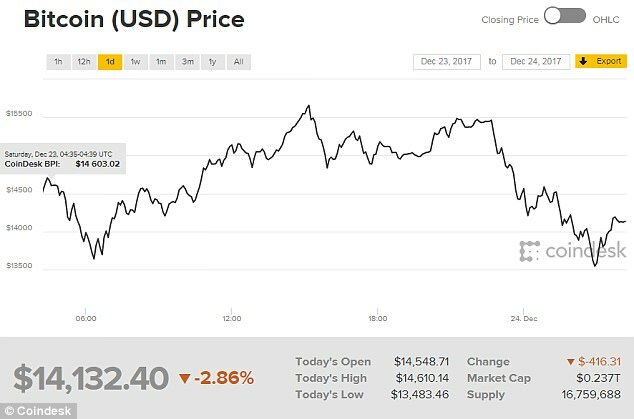 It later made up much of that ground, and slumped 9.5 percent to $14,042 Friday, according to the tracking site CoinDesk. As of late Saturday, bitcoin was trading at around $13,900, which is nearly 4.5 percent lower than the high for the day - $14,610, according to CoinDesk. 'Bubbles burst when the last buyers are in,' said Brett Ewing, chief market strategist for First Franklin. Ewing said 40 percent of bitcoin belongs to just 1,000 people, and hedge funds and other major investors are going to start buying it soon. But those funds may buy bitcoin and also protect themselves by placing bets that it will fall. Retail investors may just buy it only to see it fall. 'I think investors should approach it with caution and I think many people will dive into it not understanding what it is,' he said. As bitcoin skyrocketed this month, the volume of trading was unprecedented as investors hoping to catch a ride up piled in. Prices have risen so fast, the Friday returned the price of bitcoin only to where it was trading two weeks ago. The volatility has created a circus-like atmosphere. Some companies that have added the word 'bitcoin' or related terms to their names to get in on the action. The craziest thing is, it's worked. Long Island Iced Tea Corp. until this week had been known for its peach-, raspberry-, guava-, lemon- and mango-flavored drinks. Then, on Thursday, the company announced a radical rebranding. The Hicksville, New York, company did what investors are doing, hitching a ride on a currency that raced from less than $10,000 at the end of November to almost $20,000 on Sunday. And it cost less than $1,000 at the beginning of the year. Bitcoin futures started trading on two major exchanges - the Cboe and CME - this month. Those futures fell about 8 percent Friday. If people get burned, it won't be because they were not warned. The Securities and Exchange Commission put out a statement last week warning investors to be careful with bitcoin and other digital currencies. The Commodities Futures Trading Commission has proposed regulating bitcoin like a commodity, similar to gold or oil.